Gitkube is a tool for building and deploying Docker images on Kubernetes using git push. 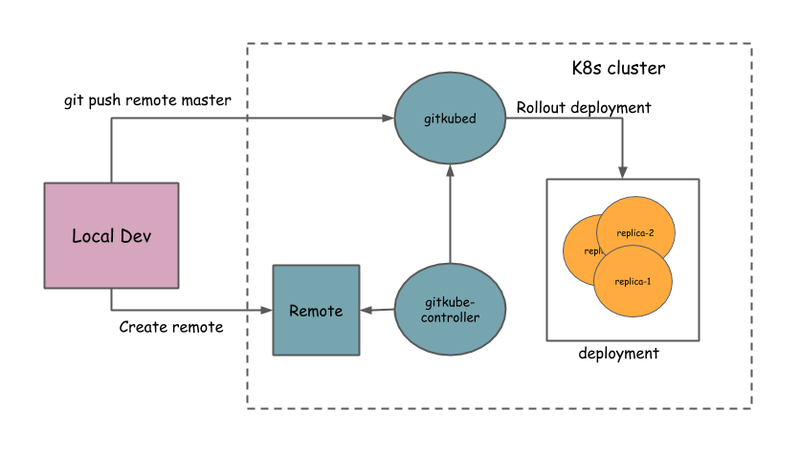 After a simple initial setup, users can simply keep git push-ing their repos to build and deploy to Kubernetes automatically. When should I use gitkube? Ideal for development where you can push your WIP branch to the cluster to test. Reference implementation for writing git-based automation on your server. Fork this repo and create your own CRD + controller + git remote hook that can do things on the Kubernetes cluster. Or download the latest release and add it to your PATH. Follow this example repo for a typical workflow of gitkube. User should have a git repo with source code and a Dockerfile. User should also create a base K8s deployment for the application. authorizedKeys: List of ssh-keys for authorizing git push. registry: Details of docker registry where images are pushed post-build. deployments: Spec for building docker image and updating corresponding K8s deployment. This project has come out of the work at hasura.io. Current maintainers @Tirumarai, @shahidh_k. Follow @gitkube to stay updated. Gitkube logo concept and design by Samudra Gupta.